A few years ago I decided to do a one-man show that would incorporate video, animation, music and live performance. The only trouble was I had never done video and had very little animation know-how. But animation was my first love when I was 5 years old and now that computers do a lot of the grunt work, it was a great time to try something new. So I bought a new G5 Mac and 50 pounds of manuals and started creating Pigeonholes. Three years later I put it on at Sixth@Penn in San Diego and the Stella Adler Theater in Hollywood, CA. The audiences loved it! Luckily we filmed the performances. I put it out on DVD (available at Amazon.com - hint) so now everyone can see it. 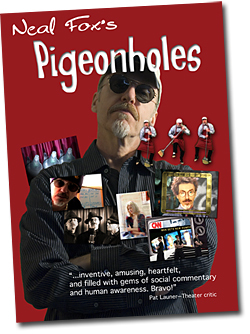 Pigeonholes was a pure labor of love. And I think it shows up in the production. Below are some reviews and audience comments and the Trailer for the show. Enjoy! "...inventive, amusing, heartfelt, and filled with gems of social commentary and human awareness. Bravo!" — Pat Launer, Theater Critic. "...the work is absolutely terrific!! The lyrics are classy, funny and moving and the melodies are really inventive. I also love the production, though I would've expected nothing less from you. "Tell Me Why" moved me very deeply. I LOVE that song! The video clips are great fun, too! You are one brilliant dude, dude." — David Pomeranz, Grammy winning songwriter, performer. "Thanks again for that inspiring and funny show. I really had a great time and you were brilliant. I'm so glad I came." — Jim Meskimen, actor, voice impersonator. "I think it's all been said (but who doesn't like to hear it again)...but just in case...Neal, you rock...You blues... You ballad...you dance...you draw...you rap (well, let's not push it, white man)...but most of all, through your song, your art, your passion... you always find a way to touch our souls...and, as a result... you make the world a better place." - L.K. "We were delightfully stunned by the scope of your talent. Having once been a professional lighting designer, musician and stage manager, I am not easily impressed. Your show was utterly original, topical, visually stimulating and downright funny. Someday we will coax you with alcohol to describe some of the processes you used to create your show... Till then we are humbly your fans,..." - R.K. and R.R. "Love your music. Your melodies are truly infectious, i.e., can't get them out of my head. Love your voice. What can I say. You know how to get your songs across, big time. Love your poignancy and your sense of humor. Love your artwork. You have an amazing way of transferring your emotions through the visual medium. Love your video work. Wonderful special effects. Thank you for this special treat." - R.B. "What a tour de force!!! You are really incredible -- not only with your music, your singing, and your art work, but also with your technological facility. This show was great fun to watch and listen to. We all wish you every success with it!" - I.R. "Mel Brooks and Groucho Marx would be proud!"